Last fall my husband’s aunt gave me three golden raspberry canes for my garden. I wasn’t sure if they were going to survive the transplant and our wild winter. One of the plants had it worse off and I did loose half of that cane, but they all started leafing outbeautifully! When I received the canes I was heavily pregnant and wasn’t up to too much garden work. So I made a rough bed for them, planted, gave them plenty of water and called it good. After Etienne was born, my mom was visiting and she helped me get a covering of hay on them to protect them from the forthcoming snow. Spring has finally sprung in the Pacific Northwest and Gardening is in full swing at my house, so I started thinking about the sad little raspberry bed that needed some TLC. I studied Geology for some time and we took many field trips. Over the years I amassed quite a collection of rocks. Being military we move a lot, and movers are less than amused when they find out you have several hundred pounds of rocks. Well, the box never got unpacked when we moved from Kentucky to Washington nearly 2 years ago and they’ve been sitting in the garage. I decided to put them in the garden so we could enjoy them. Bennett helped me unpack all the wrapped rocks, one by one. It was like Christmas for him. These are some of his favorites. 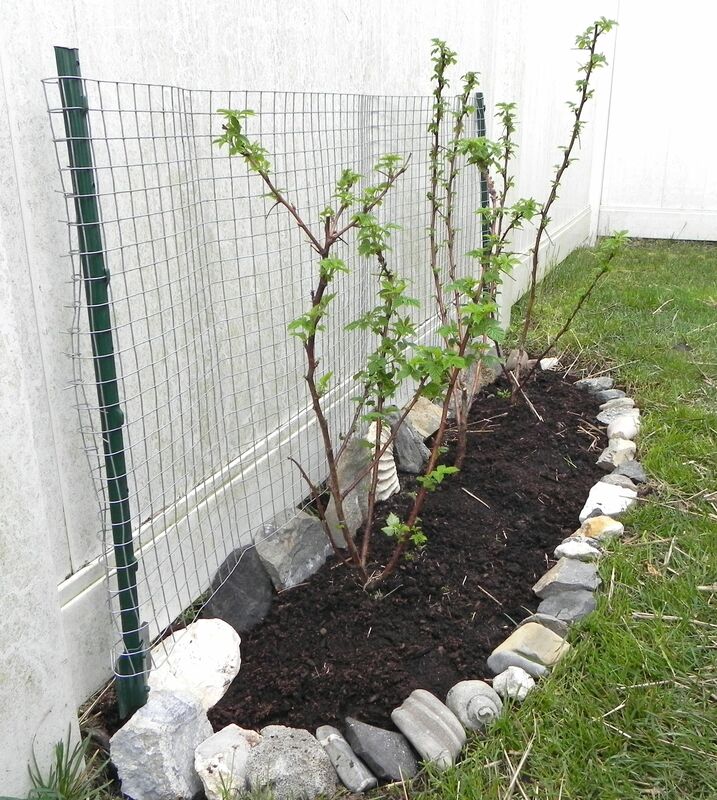 I weeded and widened the raspberry bed, fed them some organic compost, and lined the bed with my rock trove. I also put a spare bit of wire fencing up so that when the canes are heavy with fruit I can tie them up for support. I still need to secure the bottom of the fence to the posts with wire, but that can wait for another day. I’m quite excited about our new garden addition. Bennett loves raspberries, and these are an ever-bearing variety, so we should have a nice crop of berries in the summer and fall. :) I’m also happy that my rocks have a new home. I can see them daily and I can tell Bennett about them and all the different places that they’ve come from. This entry was posted in Garden and tagged DIY, Gardening, Grow your own food, Spring. Bookmark the permalink. So…if I’m your husband’s Aunt…that makes me your Aunt T also :-). So happy the raspberries are having babies. Now if you would just let me send you a little organic rabbit poo…they’d go crazy :-). Love the rocks…I have piles sitting all over the house because they were “special” :-). P.S. 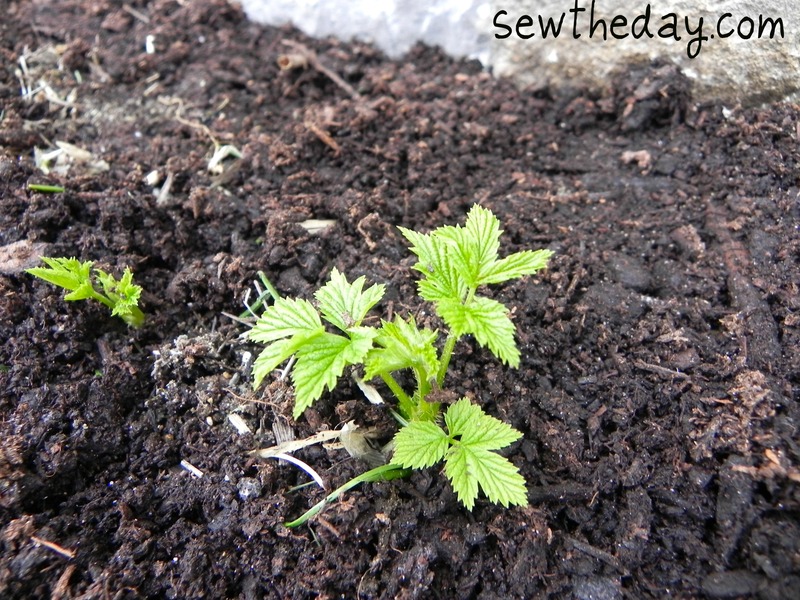 Forgot to say that those raspberry leaves, will make lovely tea :-). Awe, Thanks Aunt T. :) You can send me some rabbit poo if you really want to, but I don’t know how the postal service would feel about that. I kept a couple of my very special ones for inside. When should leaves for tea be picked?